Choose a homemade seafoam candy recipe, and make yourself an old fashioned treat. Seafoam is similar in taste to Divinity, but much lighter and foamier in its texture. 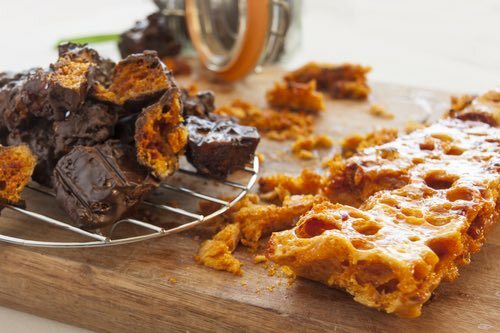 Some call it the brown-sugar divinity, but it also goes by other names: honeycomb, cinder toffee, or sponge toffee. Whatever you wish call it, it's a unique and delicious confection. Try not to over beat the egg white or the candy mixture. If over-beat, the candy will not have its characteristic density or lightness. Practice makes perfect. Some seafoam candy recipes call for white vinegar. 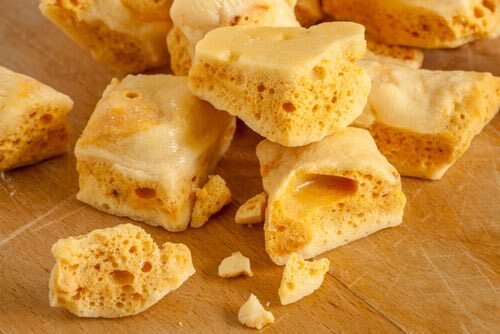 The vinegar enhances the flavor of the candy and tends to cut its sweetness, but do not overuse it, or you'll spoil your sponge toffee. As a child, I always enjoyed eating this unique confection. It magically dissolves in your mouth as you bite into it leaving a chewy brown-sugar toffee. It's so good tasting. 3 cups light-brown sugar, 1 cup cold water, 1-1/2 tablespoons white vinegar. Boil to hard ball stage (255°F), beat whites of 2 eggs and pour in the candy. Beat quite stiff, add nuts and vanilla. 3/4 cup milk, 2-1/4 cups brown sugar, 3 tablespoons butter, 3/4 cup shelled walnuts. Cook milk, butter, and sugar together until it forms a soft ball that will not stick to the fingers in cold water; remove from the fire and add walnuts; beat until it cleaves thick to the spoon; pour on buttered plates and let set until hard. 2 cups brown sugar, 1/2 cup water, lump of butter (about 2 tablespoons); cook until syrup ropes. Pour over beaten white of 1 egg and beat well. Flavor with maple or vanilla. When begins to harden spread on a tin, mark in squares. Store in tight container. This seafoam candy recipe makes a fudge that's beige colored, foamy, delicately flavored, and nutty with pecans. Combine light brown and white sugars, water, corn syrup, and salt in a heavy 2-quart saucepan. Cook covered until mixture boils rapidly. Remove lid, place candy thermometer in pan, and cook without stirring to 260°F (127°C). Remove from heat. Beat egg whites until stiff. Pour hot syrup in thin stream over egg whites, beating constantly with mixer at high speed. Add vanilla and pecan flavoring. Continue beating until soft peaks form and candy starts to lose its gloss. Stir in pecans and drop by spoonfuls onto waxed paper. When candy has set firm, store in airtight container. Makes about 50 average-sized pieces. This seafoam candy recipe makes a fudge that's very light and airy; in other words "sea foam." Butter or oil an 8-inch square baking pan; set aside. Put sugar, vinegar, syrup, and water in a heavy 4 quart saucepan (cast iron, if you have it). Gently heat the mixture, stirring with a wooden spoon, until sugar has dissolved and syrup has melted. Bring to a boil, cover, and boil for 3 minutes, then remove lid and boil until temperature reaches 285°F (140°C) on a candy thermometer. Remove from heat and stir in the baking soda, mixing well to allow bubbles to subside a little. Pour hot mixture into prepared pan and leave until just beginning to set. Mark into squares with a lightly oiled knife. Leave to cool and set completely. Cut or break into pieces. Combine chocolate chips, shortening, and baking chocolate in top of double boiler and heat over hot water to melt. Stir with a wooden spoon. Dip candy pieces into chocolate, covering completely. Let cool on waxed paper. Wrap pieces individually in waxed paper, twisting the ends together, and store in an airtight container.